ONCHAN, Isle of Man – February 1, 2016 – Swiss player Dinesh ‘NastyMinder’ Alt was last night crowned 2016 Turbo Championship of Online Poker (TCOOP) Main Event champion at PokerStars, an Amaya Inc. (Nasdaq: AYA; TSX: AYA) brand, pocketing a record TCOOP prize of $396,691.43 following a heads-up deal with ‘KungKroon’ from Sweden. The first-place prize surpassed the previous largest – won by ‘Nikki_Hefner’ in last year’s TCOOP Main Event – by just $175.05. Alt topped a field of 4,077 players after 5hr 34min to win the first major online championship of the year, getting the biggest slice of the $2,711,205 prize pool. 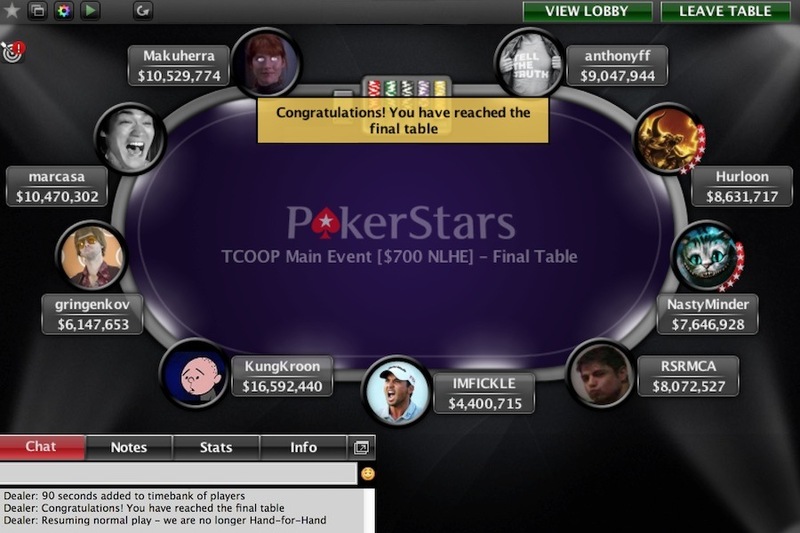 The player from Switzerland, who was also the runner-up in TCOOP-11 winning $29,220, finished the series with a total of seven cashes and a sixth-place position on the TCOOP Leader Board. Alt has also previously chopped a Sunday Million in 2014 and was the Australia New Zealand Poker Tour Sydney Main Event winner in 2013. The final few days of TCOOP threw up a host of other high-profile winners, including Team PokerStars Pro Aditya ‘Adi Agarwal’ Agarwal, who won the $215 NLHE Wrap-Up event for $160,000; Grayson ‘gray31’ Ramage, who walked away with the $2,100 NLHE Turbo High Roller title for $213,867.23 following a four-handed final table deal; and there were second TCOOP titles for ‘arxigos’, ‘buzzard1881’ and ‘robinho’. There was one other player who really stood out, with Rui ‘RuiNF’ Ferreira from Czech Republic taking down TCOOP-37 – a $215+R NLHE 6-Max Turbo – for $81,474 on Friday night to become only the third player (after James ‘Andy McLEOD’ Obst and Shawn ‘buck21’ Buchanan) to win the PokerStars Triple COOP (TCOOP, SCOOP, WCOOP titles). Ferreira bested a field of 659 players to add the TCOOP title to the SCOOP Heads-Up High stakes tournament he won in 2014, and the WCOOP victory he secured in a Big Antes event in 2015. The TCOOP 2016 Leader Board winner was ‘ouchbadbeat’ from the UK, who achieved 16 cashes – three more than anyone else this series – to finish on 340 points. Australia’s ‘ugritaly’ and Czech Republic’s ‘Zagalo87’ finished tied second on 310 points. For his efforts ‘ouchbadbeat’ receives a Champion’s Trophy and 2015 SCOOP [H] Main Event ticket, with SCOOP tickets of various denominations awarded to players ranked 2nd-100th on the Leader Board. For comprehensive results and statistics from TCOOP 2016 and all-time TCOOP records, please visit: http://psta.rs/1mpkeD0. PokerStars is the flagship brand of Rational Group, which operates gaming-related businesses and brands, including PokerStars, Full Tilt and the European Poker Tour. In 2012, 2013 and 2014, Rational Group companies in the UK and Isle of Man were recognised as one of the top 25 best places to work by the Great Place to Work Institute’s Best Workplaces – Large category ranking. Rational Group entities in Costa Rica and Dublin also achieved the same accolade in their respective local rankings in 2014. PokerStars is owned by Amaya Inc. (Nasdaq: AYA; TSX: AYA).